Scott has written 9 article(s) for InMenlo. Photographing fireworks can be a lot of fun. The best shots fill the frame up with the explosions. Below are two photos that show two ways to do it. The first photo shows fireworks last July 4th at the beach in Aptos, CA. Interestingly, these are private fireworks and stay fairly low to the ground. Note the long trails of light in this photo resulting in the classic fireworks look with multiple explosions going off at different times. To get this photo, I used a Canon 5D Mk II with a tripod. The secret to those long trails is a long exposure. I used 30 seconds for this one. Be careful. When the shutter is open that long, you can get an unwanted bright sky. Combat this by closing down the f-stop to a small opening. I used f19 on this shot. To keep the shot from looking too noisy, I used 100 ISO. My lens was a 24-70 zoom with a focal length of 43mm. The dark blacks in the background are also key elements to a shot like this. The camera settings make that happen. Additionally, by keeping the shutter open this long, I captured multiple fireworks going off over the 30 seconds. These 4 explosions did not happen at once in real time. With the long exposure, they are visible together. One more tip: Use a remote trigger or a timer delay to keep from shaking the camera when you press the shutter. 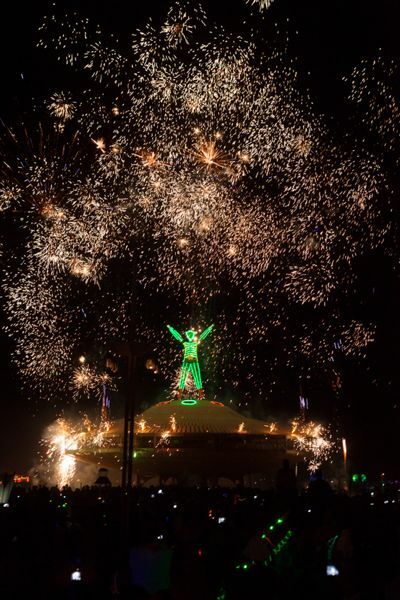 The second shot was from 2013 Burning Man. Because so many fireworks were going off at the same time, I used a shorter duration shutter speed. Note the short trails compared to the other photo. I wanted to get lights on the Man in the shot, so used a higher ISO. The settings for this shot were ISO 2000, F8.0, shutter of 1/20 seconds. Again I used my 5D Mk II my 24-70 lens on 70mm focal length. The noise from the ISO 2000 setting was corrected later in Lightroom. Here are a few other tips. Dial in your settings before the fireworks start. Get some shots of the scene in advance. Get your setting right. Make sure any iconic structures like bridges or buildings you want to be in the photo are lit the way you want. Buildings always look better if they are lit externally. You might even catch the bug and get into night photography without fireworks. To see more night photography, you can visit my website for my Burning Man Scenes and or my Structures portfolio which has several night architecture photos. Photographer Scott R. Kline has been a contributing photographer to InMenlo since 2011.